Micro-stories are numerous and exist in various geographical areas. Those collective and social stories, of the past and present, are extremely important in North African countries. However, as it is centered on tangible productions, the hierarchization of cultures has led to the negation or folklorization of these intangible heritages; and at the same time, the need for the state to assert a firm and unique national narrative has stifled this kind of narratives. Yet, these micro-stories reveal much about our contexts, cultures and societies. Indeed, taking shape from signs and alternate realities, they deploy endogenous, contextualized and renewed histories of the territories from which they are expressed. Moreover, in the era of a globalized world where the exchanges between the different zones of the globe have multiplied exponentially, it is clear that the cooperation between the nations of northern Africa remains very rare or exceptional. 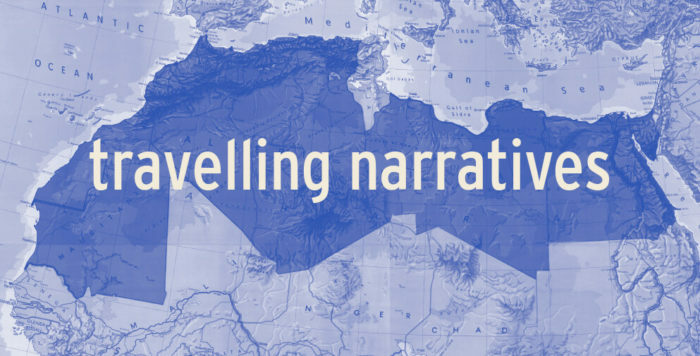 On the basis of these observations, and in order to respond to this double absence, travelling narratives is designed as a regional program of research and artistic creation that aims to cross and connect the micro-stories of northern Africa and to collectively imagine new social and cultural utopias based on these alternative narratives. By collaborating and examining alternative or forgotten narratives to the prism of a regional category, travelling narratives does not intend to flatten the peculiarities. On the contrary, its aim is to value the differences that can unite and lead to encounters and Relation*. Through a series of art residencies, exhibitions, screenings, meetings, workshops and conferences, this program occupies the position of a field of inquiry, and investigates on social and cultural issues that value new models that emerge from the alternative stories of Mauritania, Algeria, Libya, Egypt and Morocco. Also, by bringing together audiences and specialists from various disciplines, travelling narratives promotes new collaborations and encourages partnerships and cultural interactions. Through this diversified, free and public cultural programming, the project connects citizens to the contemporary arts, in order to establish and enable autonomous reflections for the reappropriation of our social spaces and our cultural references. Thus, travelling narratives is conceived as a point of connection which experiments with methods of research and artistic production in constellation, from which new consciousnesses emerge. In fact, it promotes autonomous reflections for the reappropriation of our social spaces and our cultural references, and for the decolonization of knowledge. By inviting artists, curators and researchers to narrate, witness, invent, build and share, this program opens a space of action to micro-stories so that the utopia of yesterday can constitute the reality of today and create the future. and is carried out in collaboration with the Townhouse Gallery, مؤسسة ورق للفنون – WaraQ art foundation and l’Espace culturel Diadie Tabara Camara. This programme is inspired from the project Al Amakine, une cartographie des vies invisibles by Abdessamad El Montassir.